The Malay Mail Online news report was posted on April 19, 2017. The Star Online report was posted on April 22, 2017. Both news reports speculate on the same subject - the property glut in Malaysia. The earlier report focused on the Klang Valley market and the latter on Penang. However, the situation should not differ much as both locations are in Malaysia and in highly urban cities. “The earlier report claims that the property sector’s current stagnation may last as long as 10 years! The latter report claims the excess in supply of residential properties is expected to clear in three to four years! “Just who are we supposed to believe?” Gerakan Deputy Speaker Syed Abdul Razak Alsagoff asked. “PETALING JAYA, April 19 — The property sector’s current stagnation may last as long as 10 years, an industry expert claimed today. He said so called property market experts or professionals should refrain from contradicting one another too widely as “it confuses consumers who make decisions whether to buy a property or not with his or her limited income and savings”. “Property speculators with vested interests in making insanely profits should stop confusing and exploiting the ignorance of house buyers. “Many are first time house buyers and they have limited income and savings. So, don’t exploit them by feeding them with inaccurate information or speculation,” he added. Syed Razak, who is Gerakan’s nominee to contest N.37 Bukit Lanjan in the coming 14th General Election (GE14), said “it is not right to lure people into buying a second property as an investment with inaccurate information”. “In whatever matter, honesty and accuracy should be upheld. Not just plain heartless hard sell for profits. Think of the hard earned savings of the middle income group. “As for consumers, be careful or cautious with what you read and believe in the media. It is about your hard earned life savings and it pays to be cautious and not to be greedy, lest you get yourself into a sticky financial burden,” he added. THE excess in supply of residential properties is expected to clear in three to four years, paving the way for a recovery in the property market, says housing industry experts. The new National Information Property Centre (Napic) 2016 report shows that the incoming supply of residential properties has inflated to 94,124 units, compared to 82,837 units in 2015. Incoming supply refers to those properties undergoing construction work to be completed in three to four years. “The incoming supply figure looks alarming at first glance. In actual fact, however, about half of the amount has been sold. “Developers would normally commence construction work only when they have sold at least 30% of a project. “In 2016, the transactions of residential properties in Penang totalled 13,244 units worth RM5.36bil,” according to Napic. “If the consumption per year continues at 12,000 to 13,000, it should take three to four years for the market to absorb the remaining 47,000 units,” Real Estate & Housing Developers’ Association (Rehda) Penang chairman Datuk Toh Chin Leong says. Toh adds that the market could expect some signs of improvement in the second half of 2018. Some 51,453 units of the 94,124 are in the higher price range category, comprising 2-3 storey terraces, 2-3 semi-detached houses, detached houses, and condominiums, indicating an excess supply of high-end properties. There are 10,968 high-end units coming to the north-east district, while a further 12,833 are heading to the south-west district. Some 27,652 units of similar high-end properties are coming to Seberang Prai. The planned supply (projects with approved building plans), however, has decreased to 48,120 in 2016, compared with 54,840 in 2015. On the planned supply, Toh says developers would normally hold back new launches if there is a glut in the market, even if the projects are already approved. “The positive side is that due to the excess in supply, the days of rapidly escalating property prices are over. 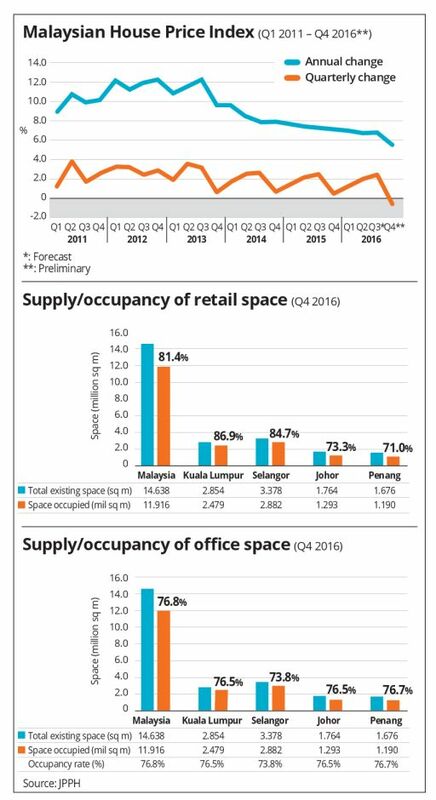 “We can expect Penang property prices to remain stable in the years to come. “Due to the choices for properties in the market, the pricing of the incoming supply will be very competitive. “Bank interest rates, however, will need to be maintained at a low level to stimulate interest in the property market,” he says. Raine & Horne Malaysia director Michael Geh concurs that the local property market could recover in three to four years, provided that the market continues absorbing 12,000-13,000 units per annum. However, the surge of unsold completed residential properties in Penang is a cause for concern. “The unsold completed units have doubled to 1,896 in 2016 compared to 992 in 2015. “The market value of the 1,896 units is RM1.47bil, compared with RM801.88mil in 2015,” he says. There were 5,646 new launches in the primary market in 2016, compared with 2,348 units in 2015. “However, sales of the newly launched 5,646 units is low at 9.9%, compared to 48.2% in 2015. “Apartments and condominiums formed the bulk of the new launches, accounting for 56.4% (3,187 units), priced between RM500,000 and RM1mil,” Geh adds. Unless foreign funds help to absorb the high-end properties, the pricing in this segment will undergo a correction. As China has restricted funds from flowing out to purchase overseas properties, the scenario of a price adjustment in the high-end property segment is very likely. “The demand most definitely will not come from locals as the average household income in the country ranges between RM4,585 and RM6,141 per month, making ownerships of high-end homes a dream. “We welcome a pricing correction scenario in the high-end segment, as prices in the high-end category has peaked. “All eyes are now on how Bank Negara will tweak interest rates to deal with inflation and pressure on the ringgit. “In January 2017, Bank Negara has said it will hold on to the current benchmark interest rates at 3%, on expectation that inflation will average higher this year due to stronger oil prices. “We hope Bank Negara will continue maintaining interest rates at a moderate level to sustain the property market,” he says. In contrast to the high-end segment, the transactions in the sub-sales market are still encouraging. “About 80% of the transactions in the property market today come from the sub-sales market. “In George Town, the values of older apartments, built in early 2000, have more than doubled. “A 700-800 sq ft apartment, completed 12 years ago in George Town, is now selling for over RM400,000, compared to the initial selling price of about RM130,000. “Given the competition from the sub-sales market, the pricing of properties in the primary market will eventually be adjusted to a moderate level. “Residential properties in the primary market are currently priced about 25% above those in the sub-sales segment,” he says. CA Lim & Co principal Lim Chien Aun says it is not unreasonable to expect the property market to recover in three to four years’ time. Bank Negara, however, must keep interest rates low to prevent a fire-sale situation in the property market. “Many people have forgotten that there was a property crisis in Penang in the second half of 1980s, which saw property prices dipped by about 50%. “Those with little or no memory of the crisis don’t think that property prices in Penang can take a deep plunge. “The downside of a low interest rate regime is that it will create new bubbles in the property market, making it difficult for prices to undergo correction, while there is little improvement in the real economy,” Lim says. The state authorities should plan for residential projects in neighbourhoods where there are reliable transportation connections to their work place. “There must also be sufficient utility infrastructure to support an increase in the population size of a neighbourhood. “With the minimum of two adult persons to a house, there will be about 20,000 people coming to stay in the north-east district. “Can the existing utility infrastructure support the increase? “How many people can afford to buy high-end homes?” Lim asked. Lim says that Penang cannot be developed as though it is a financial centre like Hong Kong or Singapore. “The difference between Penang and HK and Singapore is that the return on investment over here is unattractive. “The current rental yield per annum for properties in general is less than 5%, and for residential properties, it hovers around 2.5%.“The yield should be around 5% to 6% in order to be attractive, emphasising the need for studies and policies to be carried out to address this very important criteria. “The participation of foreign buyers in the local market is also small, less than 8%,” he says.Ideal Property executive chairman Datuk Alex Ooi says the new higher density policy will give developers the room to plan different pricing properties to correct the imbalance in the high-end segment. The local authorities has recently increased the density per acre to 128 units from the previous 87 units. Developers with the landbank to develop creatively designed projects with moderate pricing stand a better chance of competing in the market, Ooi says. “Our land bank in the south-west district will be used to develop properties of various sizes and pricing. “We always need to ask... if we build large properties in a strategic location, can we sell them? “What is the demand for these properties?” he asks."